Steve Davis Snooker is the ultimate snooker simulation for all home computers. Packed with features, and endorsed by the World No. 1 himself. A must for all sport fans. 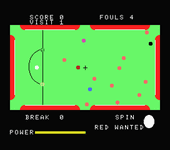 Steve Davis Snooker Features include: computer play option (nine levels), trick shot edit facility, icon control, joystick option, friction factor plus many more. ZZAP!64 "Superlative snooker simulation .... this is the best."